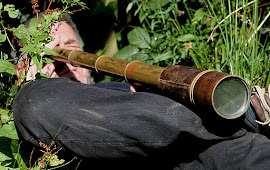 The Grumpy Ecologist: Fancy a bit of rough? 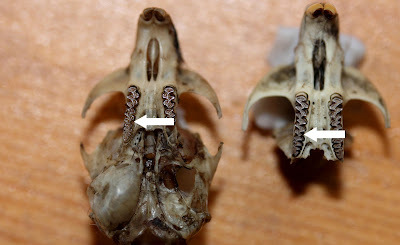 Field Vole, SEO pellet, Bank (left) and Field Vole skulls, showing the diagnostic extra loop on the upper middle molar of the Field Vole. This winter’s influx of Short-eared Owls, Hen Harriers and Rough-legged Buzzards has been one of the highlights of the season. Many have settled in areas of un-grazed, rough grassland, a habitat that often seems to be quickly dismissed by conservationists as having little value. It is often botanically poor (especially if it’s of recent origin) and the list of ‘what to do with it?’ usually starts with grazing or mowing. 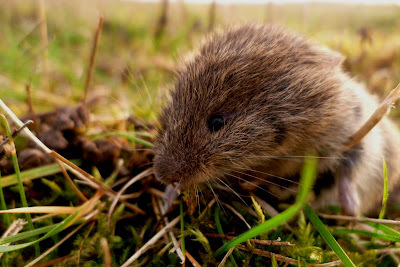 Rough grasslands can support good populations of small mammals, such as voles, a major part of the diet of these species. Voles and some other small mammals typically show cyclical patterns of abundance. After a crash in the small mammal populations in the northern breeding areas of these birds, they move south and west and settle to winter where suitable food is available. The diet of Short-eared Owls has been shown to consist of 95% of small mammals over numerous studies. In Britain, Field Voles account for about 85% of the diet. When voles are scarce however, SEOs will take an increased proportion of birds. In the early 1980s when SEOs regularly wintered in the Lee Valley, remains of birds were numerous in the pellets, forming a third or more of prey items. The owls seemed to be specialising on thrushes, Skylarks, finches and buntings. A pellet from one newly arrived owl at Nazeing contained the leg of a Blackbird that had been ringed previously on the Essex coast. Half a dozen pellets picked up from Heartwood Forest this weekend revealed remains of 9 Field Voles and a single Bank Vole. Rough-legged Buzzards also specialise in small mammals, notably voles and lemmings, although wintering UK birds are noted as favouring Rabbits. Field Voles favour rough grassland with a dense thatch in which to burrow. In new grasslands they reach reasonable densities by the second year of establishment. 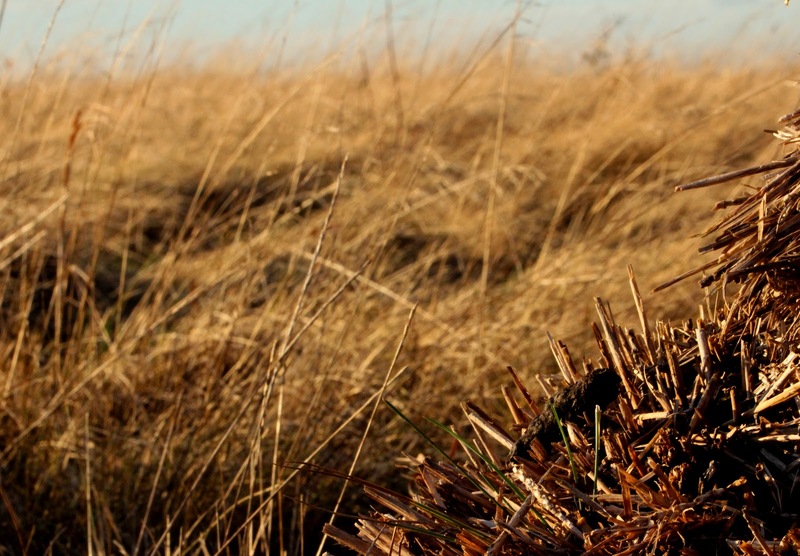 Some research has shown that SEO hunting periods over rough grassland are positively related to vole densities until the grassland becomes densely thatched. At this stage (greater than 80% dense thatch), the relationship switches to negative; there are just as many, if not more voles, but the density of the vegetation makes them less vulnerable to predation by the owls. However, there is some suggestion that light grazing or limited cutting of older grassland may benefit the voles in that it promotes more vigorous growth of fresh, palatable grass. Such practices are just as likely to benefit the owls. So rotational strip mowing in old, tussocky grassland (perhaps a 4-6 year rotation) may benefit voles by producing fresh growth and owls by making the voles more available.